Treat yourself! Take a scenic drive through the rolling hills of Oldham County. Discover your very own country estate with all the amenities of the city. 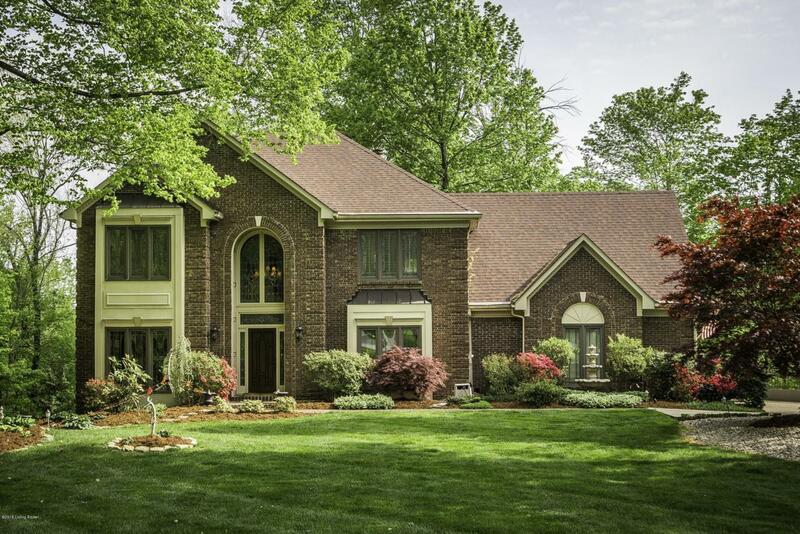 Nestled among the trees, this home offers a private paradise with fantastic views of the marina below & is in the award-winning North Oldham school district. Join the tranquility afforded residents in this peaceful setting. This meticulously-maintained home is sure to impress.This home features the best of both worlds in classic elegance and updated living. Exquisite architectural accents are plentiful in this magnificent home. An awesome view awaits from every window. Entertain family and friends outside on the deck or gather on the patio while admiring all nature has to offer. Welcome guests in the foyer that features a chandelier, hardwood floors, stained glass palladium window, and 2 guest closets. To your left is the handsome office or library with detailed millwork, pocket doors, and built-in bookcases. From here visit the elegant formal dining room complete with dentil molding, chair rail, and chandelier. Make your way to the relaxing family room with gas log fireplace, beamed ceiling, wet bar, access to the deck, and built-in cabinetry. The chef of the family will feel right at home in the eat-in kitchen. Features include Silestone countertop, stainless appliances, hardwood cabinetry, pantry, planning desk, and access to the deck with gorgeous views of the backyard. A guest bath and laundry room round out the main level. On the second level retreat to the luxurious owner's suite complete with sitting area, crown molding, woodburning see-through fireplace, private deck with river views, and spa-like en-suite bath that has been recently updated. Here you can relax in the whirlpool tub or separate shower with 2 shower heads. There are separate vanities with granite counters, and a skylight. Find a place for everything in the enormous walk-in closet complete with custom built-ins. There are two additional bedrooms on the second level connected by a Jack-n-Jill bath. Each bedroom has its own vanity. Enjoy the night sky through the skylight in the first bedroom. The second bedroom features a charming sitting area. In the lower level, discover a separate flex room that could also serve as a 4th bedroom (no egress) with two closets, media room, or office. Close by is the third full bath. A perfect place to entertain family and friends, there is plenty of space in the family room with wet bar that includes a fridge and ice maker. Enjoy the game room complete with pool table. Or walk out to the covered deck and take a relaxing soak in the hot tub. Boat lovers will enjoy the convenience of Tartan's Landing Marina, just minutes away. Additional features of this extraordinary home include new carpeting, Andersen windows, gutter helmet, whole house dual heating system, central vac, & intercom. Don't miss this peaceful serenity that could be yours. Located with convenient access to interstates, downtown Louisville, shopping, a marina for boating on the Ohio, and restaurants. All this and located in the award winning North Oldham County School district!